This unit explores the significance of ancient Roman artifacts for Italian painters of the fifteenth and early sixteenth centuries. The essay begins with a brief overview of art and architecture during the Roman Empire and addresses both the destruction and the survival of antiquities in the Christian era. It investigates the symbolic and thematic uses of Roman ruins in fifteenth-century paintings of Christian subject matter. 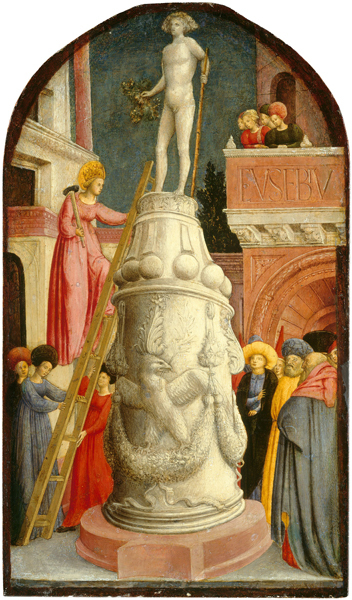 Specific formal devices employed in ancient art—such as contrapposto, the canon of ideal proportion, and the use of drapery to reveal the body—are shown to have influenced Renaissance depictions of the human body. Beginning in the late fifteenth century, the imagery of ancient relief sculptures inspired painters to aim for greater historical verisimilitude in their reconstructions of the ancient Roman world. The final section examines the self-fashioning of Renaissance artists as rivals and heirs to their ancient predecessors.